So the grouting is finished & sealed, 2 applications on the floor and 1 application on the shower walls. 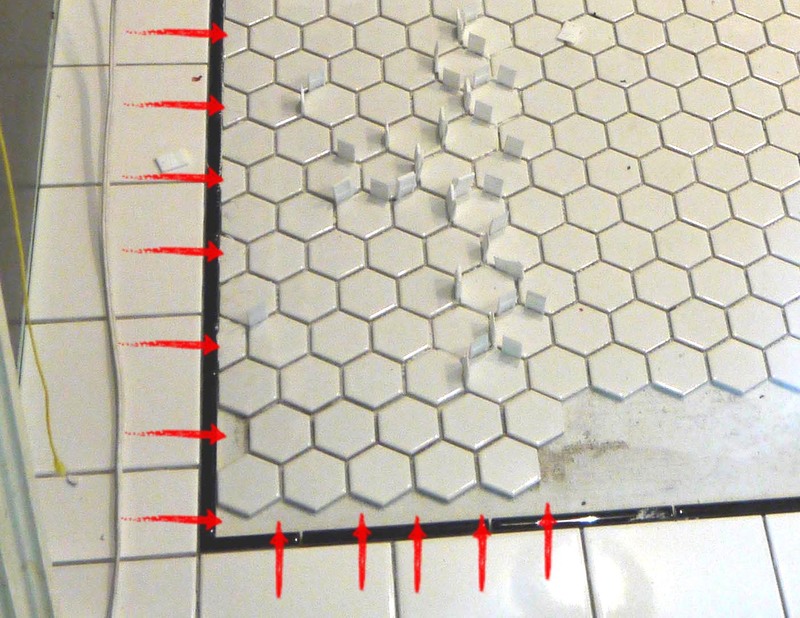 Now when the grout gets wet, the water runs across it in little beads. According to the bottle, it must be reapplied in 6 months, but then should last 20 years…? Sounds funny to me, but I’ll do it their way. 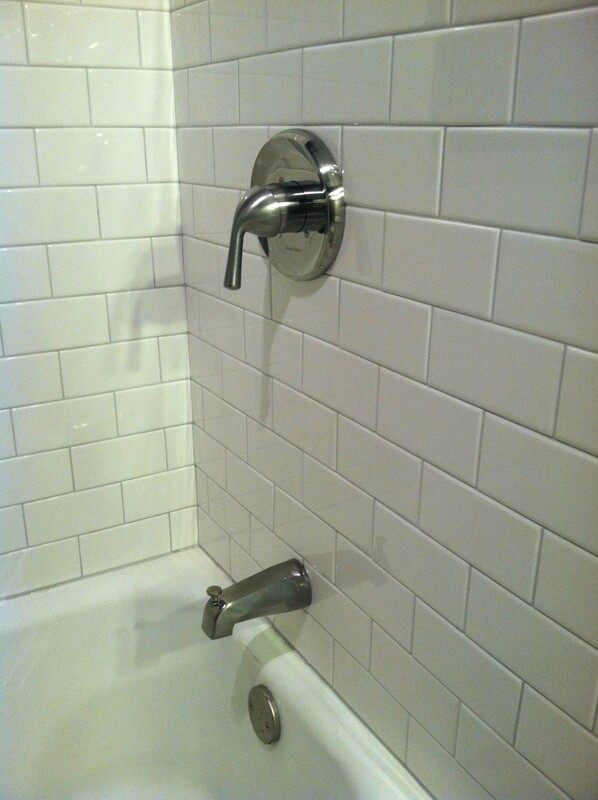 A large step forward was connecting the tub faucet and then attaching the mixer plate & handle. Pretty straightforward, except when trying to get the tub faucet to point downward. After screwing the faucet on and off about 20 times (and going through about half a roll of teflon tape) I finally got it to point down. Apparently there is a rule of thumb that the threaded pipe sticking out of the wall should be a very specific distance off the finish wall. But where is the fun in after the fact? I nearly cut my palm twisting it so hard, getting it to the right position, but I got it! The mixer plate and handle were pretty straightforward. The plate already had a seal attached to the back, so I simply had to line it up level and screw into place. First thing was to line up the toilet flange and mark the holes where I would need to pre-drill. Turns out the floor tile is hard as nails. 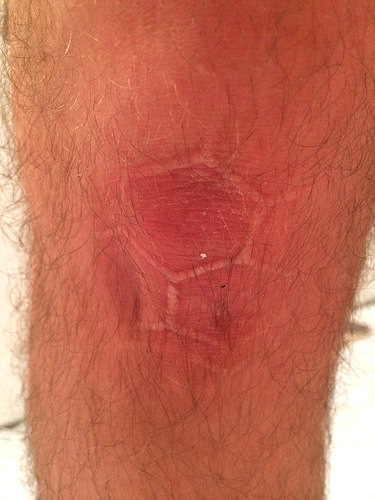 Even with a masonry bit, drilling directly into the face of these little hexagons was next to impossible. The bit would smoke and eventually turn red hot at the tip – wasn’t working. 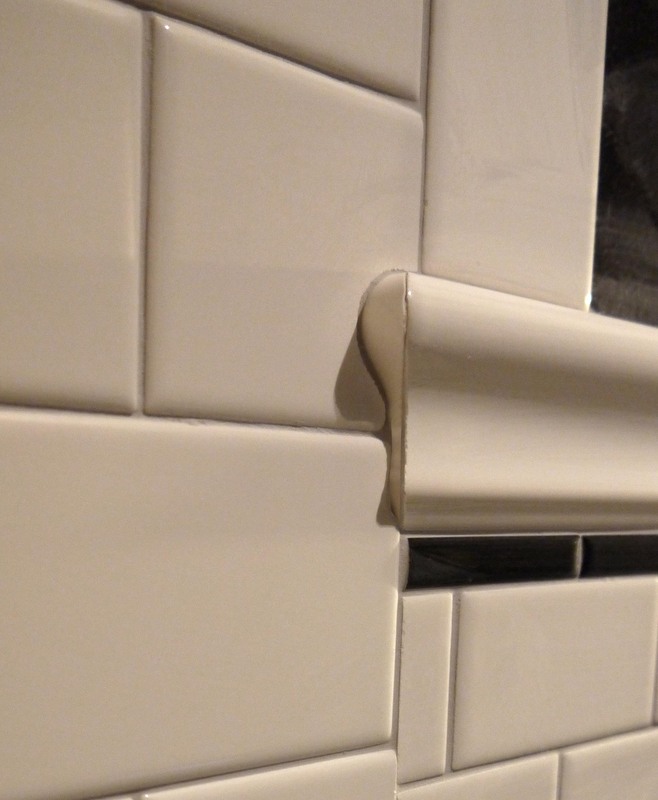 Because these tiles will never be visible, I used a hammer and nail-set to punch a hole or crack the tiles where the screws needed to be – this worked much better. Then I could screw the flange tight to the finish floor. 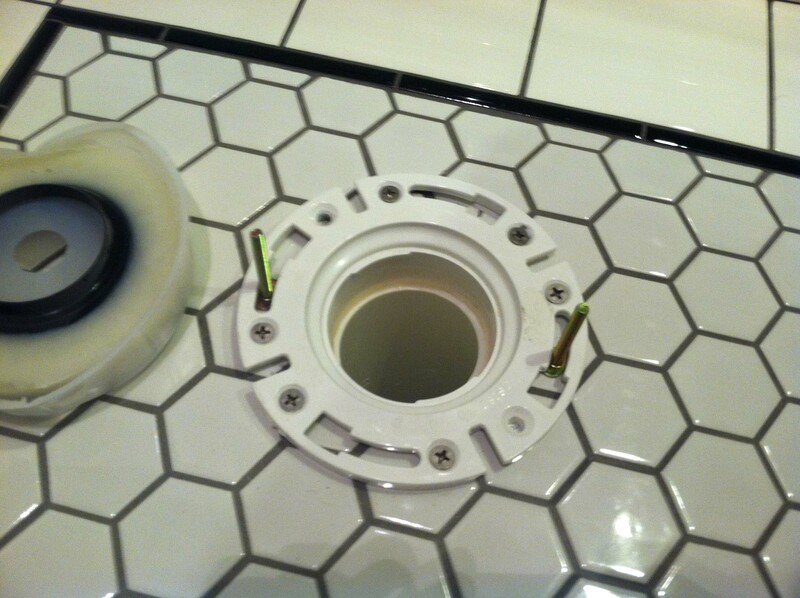 I used 2″ stainless steel screws, and they fit in the countersunk holes just right. 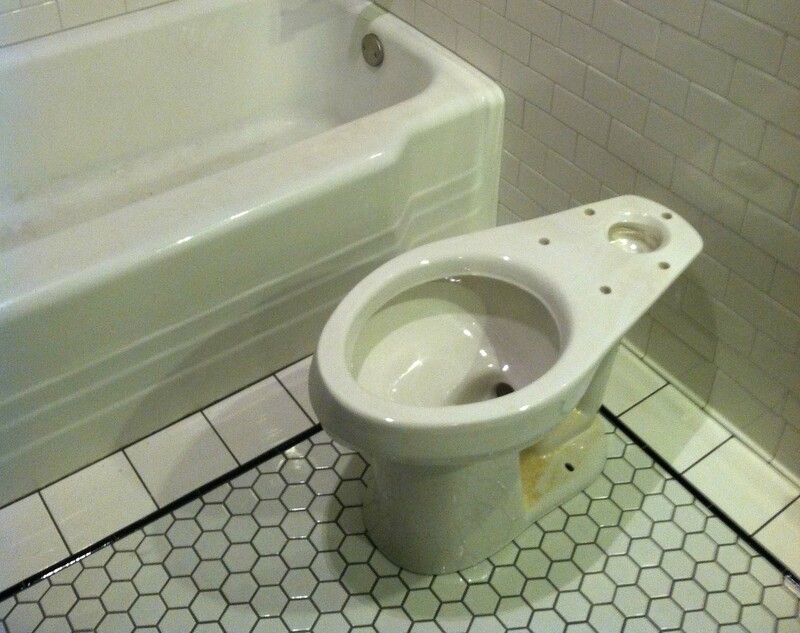 I actually found quite a bit of discussion on plumbing & construction forums about whether the toilet flange is supposed to be affixed atop of the finish floor (as I did) or if it was meant to be attached before the tile so it would be flush with the finish floor. It sounds like it depends on different areas of the US as to which method is more popular among licensed plumbers. And I’m pretty sure I’ve seen both examples when replacing different toilets, and neither have leaked. Who knows. Above the flange is screwed into place (it only required 4 screws, but I used 6 just to make sure – this toilet is going no-where!). I have set the toilet anchor bolts into place and the wax seal is to the left, upside down in the plastic liner. Trying not to get my hands too dirty, I flipped the wax seal into place and peeled the plastic liner away. Then it was time to carefully lower the toilet onto the wax ring, trying to line up the anchor bolts with the corresponding holes in the toilet base. I never know exactly how tight to bolt down the base. 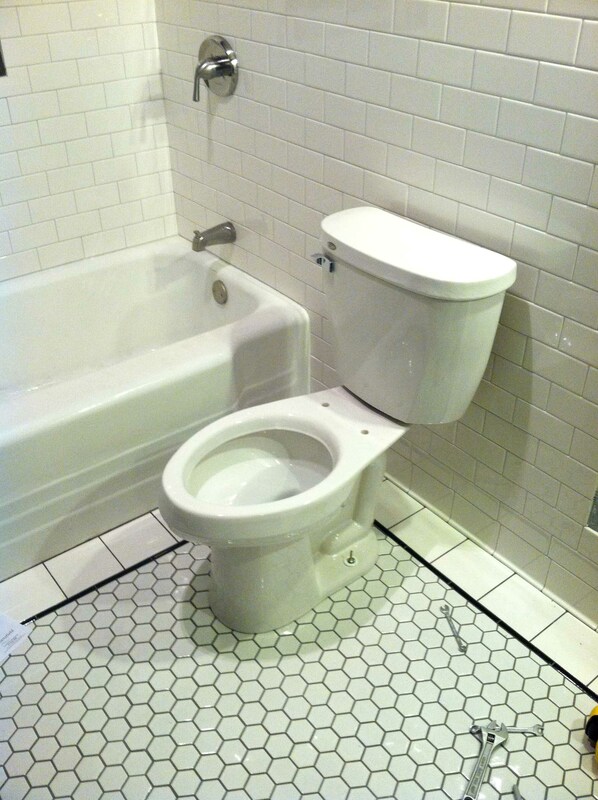 I typically tighten the bolts evenly, making sure the toilet has no play and doesn’t rock at all on the floor. When the metal washers start to bend, I figure that is tight enough. I’m always worried about cracking the porcelain – I hear it can happen if you over tighten. Attaching the tank is pretty straightforward. Set the rubber gasket on the underneath of the tank, and lower the tank onto the base. This model had 3 bolts. I made sure to tighten them evenly until I felt the gasket was evenly compressed. If the tank looked off-level, I simply tighten the opposite side to adjust. I used a metal hack saw to cut off the tops of the anchor bolts, and then snapped on the plastic bolt covers. A simple braided water supply line, voila! I have a both a working tub and toilet tonight! I’m still readying the dresser before I can set the sink into place. 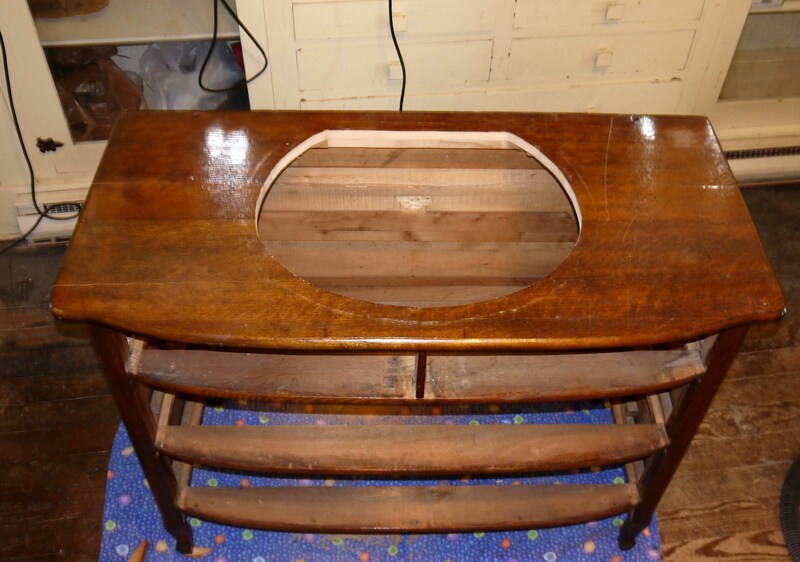 I’m using marine varnish, and it requires 6 coats to have a thick and water durable finish on top. 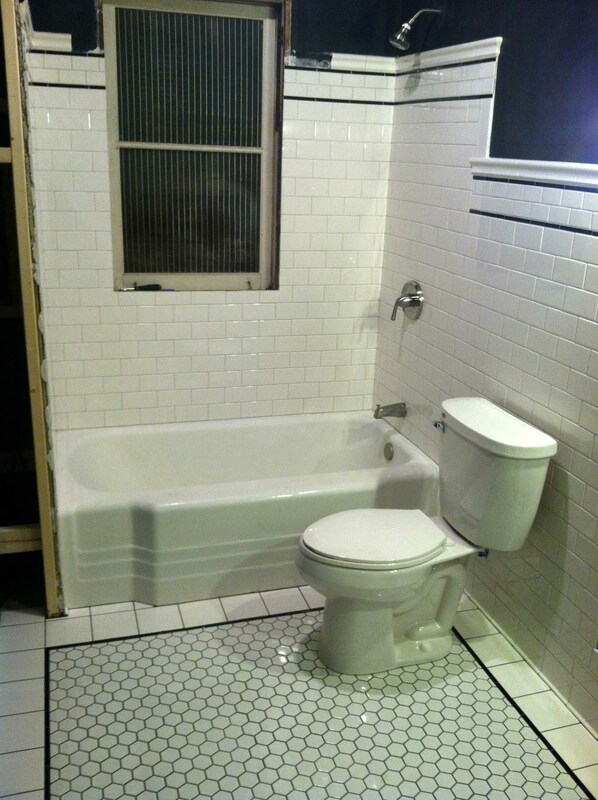 So what’s left before this bathroom and be a bath-done? 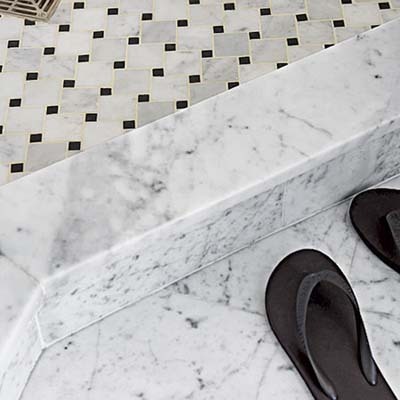 I love the look of white and gray Carrara marble, especially the aged floors and walls one can find in period homes and old buildings. It’s a rather soft stone, so it shows wear after decades of use. But that wear adds to its beauty. Unfortunately, I really couldn’t afford marble for my bathroom. 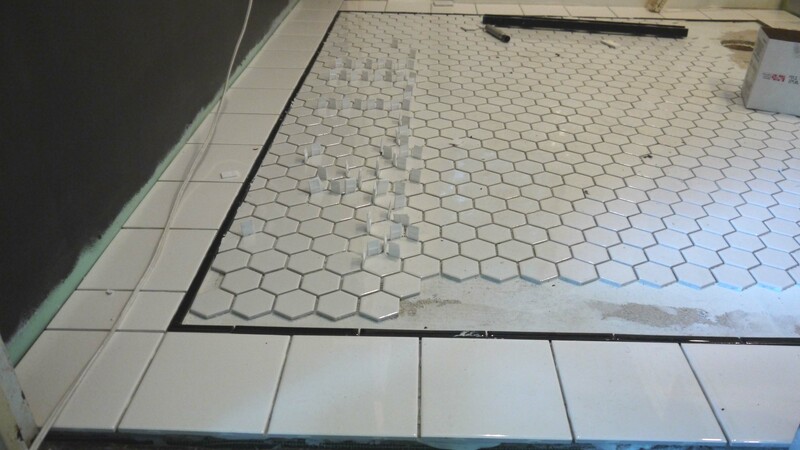 There is just too much tile on the walls, and even the floor would have been too expensive in marble hexagon mosaic. I just couldn’t justify investing that much into this modest of a home – a humble 2-bedroom house in this neighborhood won’t see that return on re-sale anytime soon. But I found a way to get my beloved marble after all – and affordably. 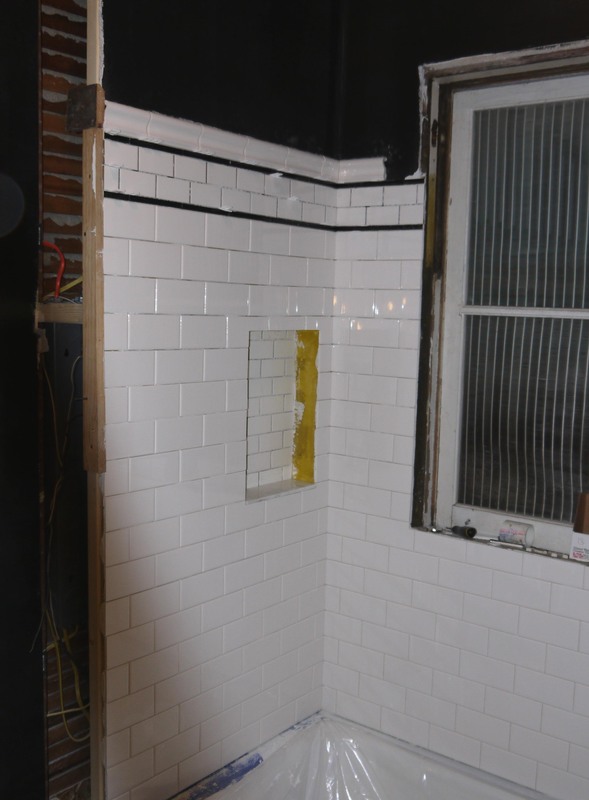 When it came to tiling the built-in niche, I used the mini-subway tiles (2″ x 3″) for the back wall, and I planned to use bullnose edge tiles for the sides to wrap back to the shower wall. But I didn’t like how the bullnose tiles looked on the bottom ledge. 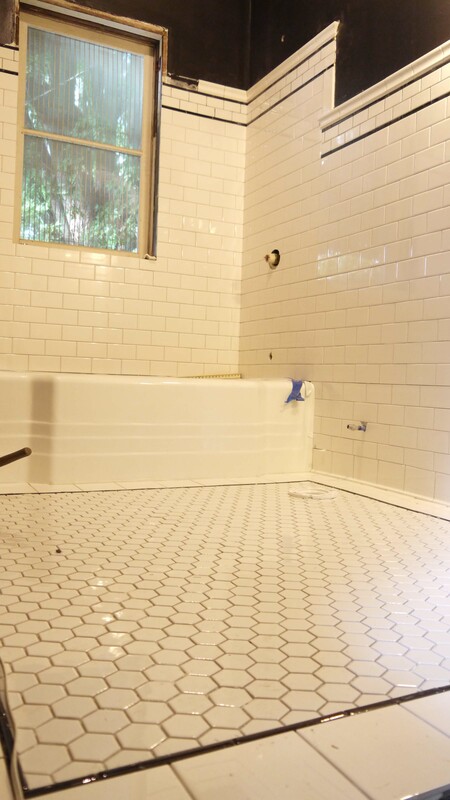 Knowing that soap bars and bottles would be sitting here wet, that would have meant constantly dirty grout lines. 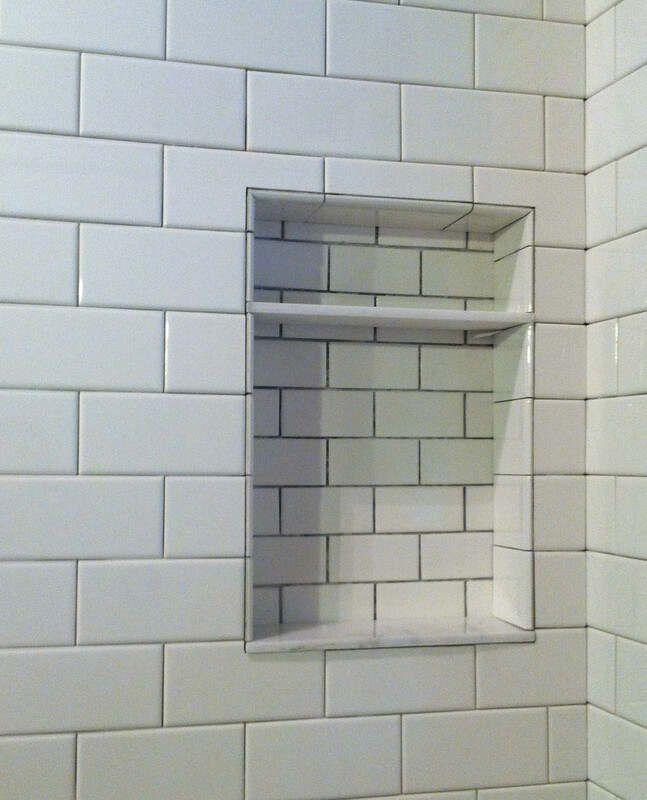 Not to mention, I’m not sure how I would make a shelf in the middle using smaller tiles – how would it hold itself up? 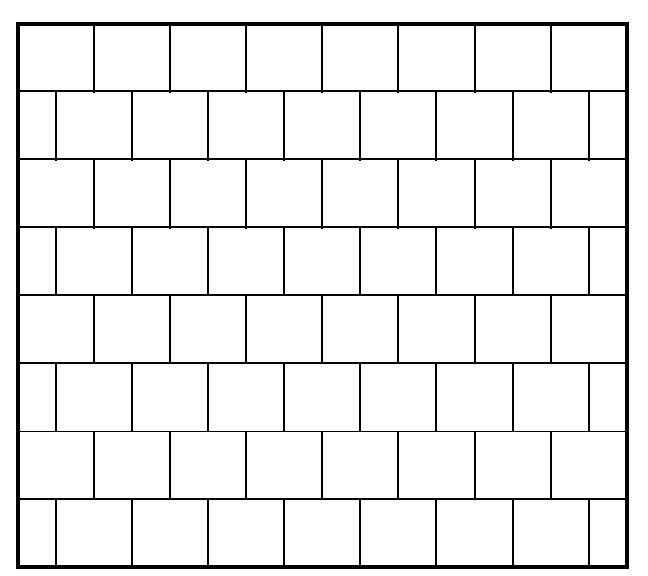 So while walking through the tile aisle at Home Depot, I saw how affordable 12″ x 12″ marble tiles are – $3.99. And I realized I could get both the bottom ledge and center shelf from a single square. 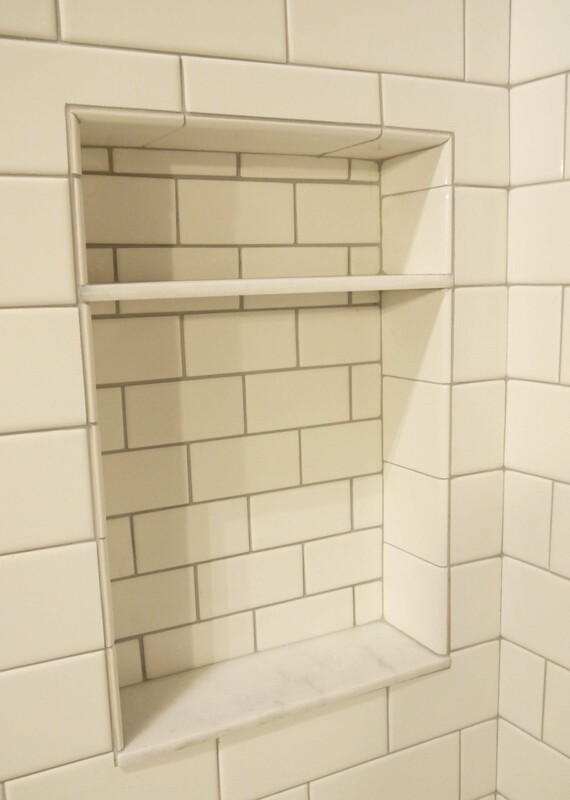 I cut and installed the bottom ledge first, and I liked how it looked to keep it slightly proud – 1/8″ or so – of the surrounding wall tiles. It gives it more pronunciation, and that “I designed it like this on purpose” look. 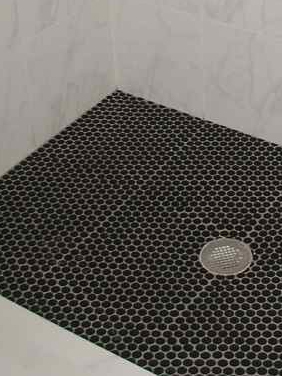 To make sure it drains, I pressed it into the fresh thin-set and pressed harder along the front edge – so it is slightly slanted out toward the tub. For the sides, I used a bullnose tile. 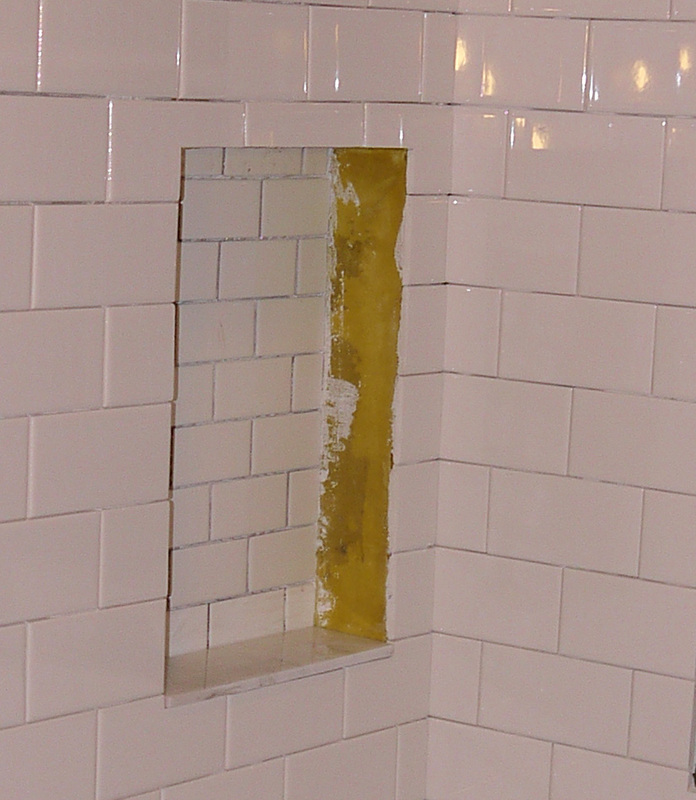 Because the niche is 4″ deep, the 3″ bullnose tile wasnt deep enough. 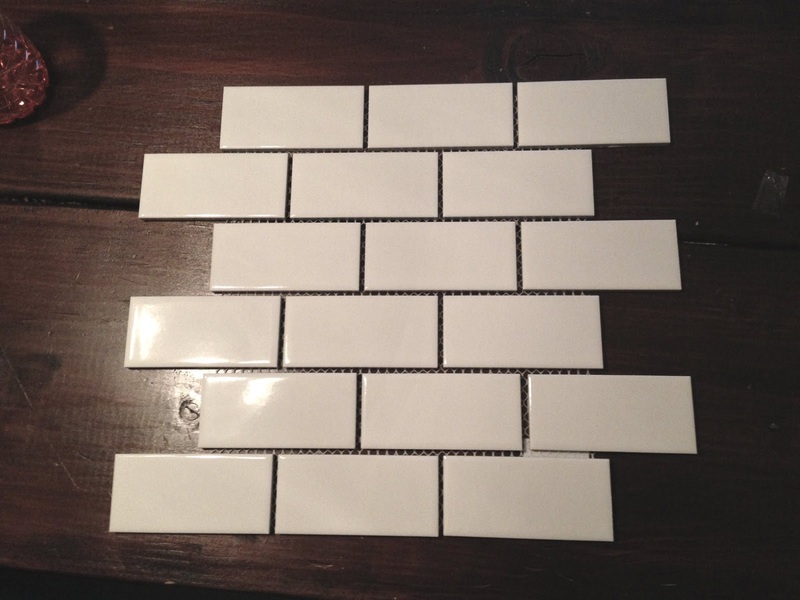 I had to use 4″ bullnose tiles, so up and down both sides I had to cut each tile so that the grout lines would line up. I went 4 tiles high -the equivalent of 12 inches- then set the next marble piece in to act as the upper shelf. It sits on the tiles below it. Where the top and sides meet, I cut the meeting edge at a 45 degree angle to miter the corners. The resulting niche is below. 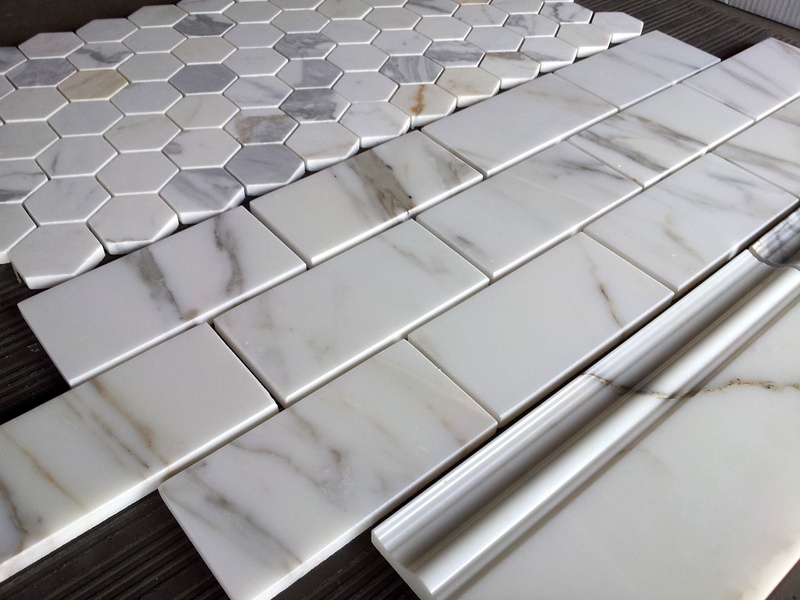 The marble looks great, just a hint of natural stone in the field of all white ceramic tile. Both the ledge and shelf are just slightly pitched to drain outward, so water will drain. The only thing I realized afterward is that the factory edge of the marble isn’t exactly smooth. In fact, it’s almost sharp. Not “cut off a finger” sharp, but “ouch,” noticeably sharper than it should be. I’m thinking I will try to hone it down with wet-sandpaper and see what that does. Grouting this was a little tricky also. 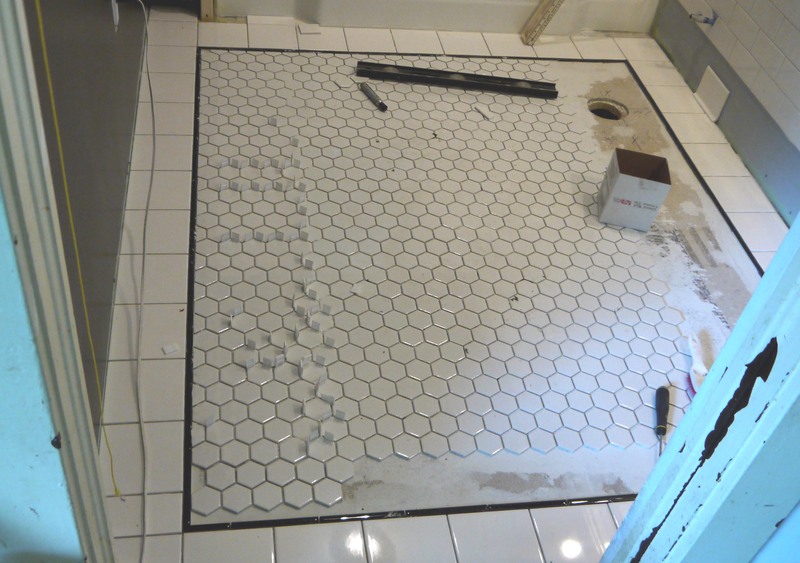 The tile float was almost too big, especially in the upper part. 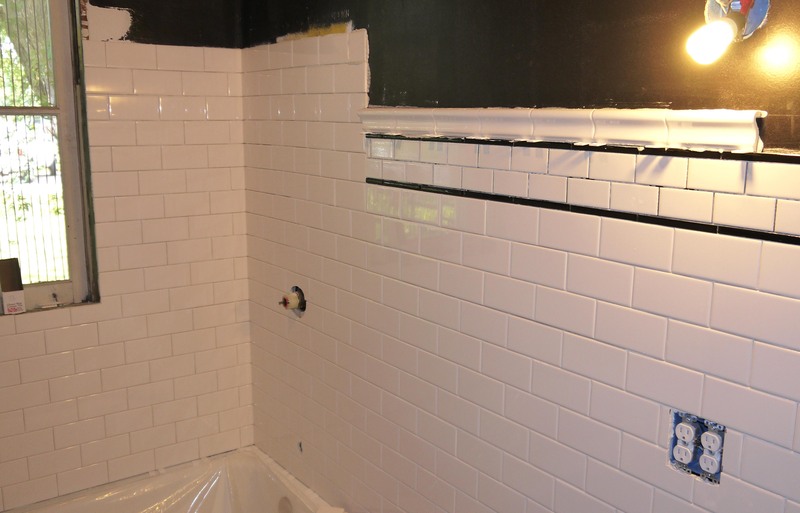 But the beauty of grout is that messy doesn’t matter, it all sponges off. I’m thrilled with how it looks! Not a huge amount of shampoo storage, but enough for 5 or 6 bottles lined up sideways, and a few bars of soap on the shelf above.